Fig. 10.14 Pressure recording in the female bladder and urethra. Upper trace, pressure recorded in the urethra, middle trace, pressure recorded in the bladder, bottom trace subtracted pressure, showing the element generated by the urethra and its surrounding structures. A, B and C are urethral pressure profiles, recorded by pulling the recording catheter through the length of the urethra from the bladder (Lt) to the external meatus (right). In C the subject was asked to cough during the recording. 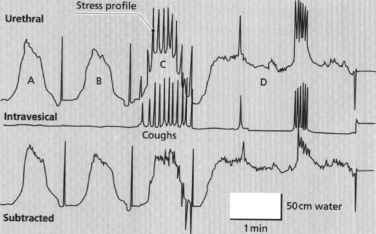 Coughing increases abdominal pressure, which is reflected equally in the bladder and proximal urethra, as can be seen on the left of the subtracted trace where the pressure rises are cancelled out. In the centre of the urethra, the subtracted trace shows a positive response to coughing, but as the catheter is pulled further, the negative going deflections indicate that the bladder pressure is not passively transferred to the distal urethra. In D, the catheter is kept in the maximum pressure region of the urethra, and again the patient asked to give a single, then a series of, coughs. In this region the subtracted trace shows the active response of the urethra] wall. This reflex helps prevent leakage when the abdominal pressure rises. 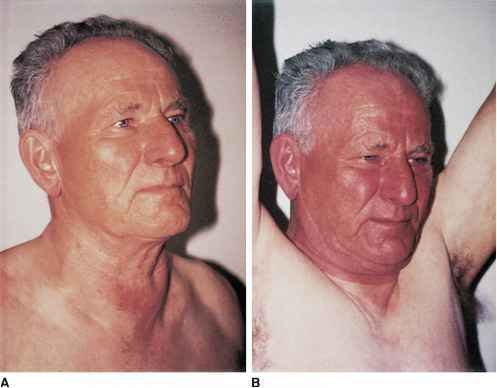 hence the pressure in the bladder), as occurs with such events as coughing, sneezing or straining (Fig. 10.14). This striated muscle is supplied by motor nerves with their cell bodies in S2-S4, the fibres running mostly in the pudendal nerve and pelvic nerves. The striated muscle fibres are heterogeneous (particularly in the male), being a mixture of the slow-twitch and fast-twitch types (Fig. 10.15), the slow-twitch fibres being capable of sustained contraction over relatively long periods of time. The striated muscle of the pelvic floor also contains fast-twitch and slow-twitch fibres, and may be important in maintaining continence, particularly for holding the urethra in the correct position. It might also supply an additional occlusive force on the urethra.